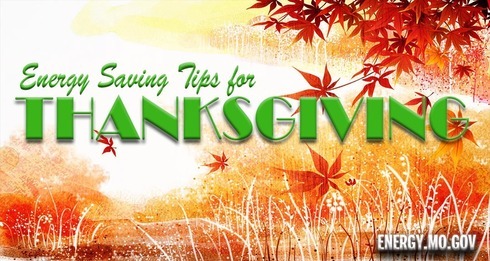 Thanksgiving is one week away and before enjoying your Thanksgiving feast, Missouri’s Division of Energy would like to offer 15 energy-saving tips to save money and energy this holiday season. Plan to cook side dishes in the oven alongside the main course. This will save energy and time. It is not necessary to preheat your oven when slow-roasting a turkey (or any kind of meat) for several hours. Let the bird warm up slowly with the oven. Do not stuff the turkey before cooking. Cooking a turkey with dressing takes more time, so cook the turkey and dressing separately. Try lowering the thermostat in your home. The heat from your oven will warm the house. Use your oven’s convection setting when possible – it will cook the food evenly and use less heat. Cook with a slow cooker (or microwave), whenever possible, a slow cooker uses less energy than an oven. Let the leftover food cool before placing in the refrigerator. Putting hot or warm dishes into the fridge causes the refrigerator to work harder to cool the food. After the meal, scrape plates instead of rinsing them with hot water. This will get the dishes clean without a pre-rinse. If possible, skip hand-washing dishes – a dishwasher uses less water. Do not buy a turkey bigger than the group that will be partaking in the feast. A smaller turkey takes less time to cook. If guests are expected, lower the thermostat a few degrees before they arrive. A large gathering will generate heat. If possible, install automatic lights for when a room is unoccupied. Set your thermostat to a lower setting when leaving for the holidays. Set your lights on a timer. Setting a timer will not only help you save energy but the timer will also ensure your home does not look unoccupied while you are away. Lower the blinds and close the curtains. Doing this will keep heat from escaping. Interested in more energy saving tips for the winter? Visit https://energy.mo.gov/resources/winter-heating-tips .